From NYC / Eastern NJ – Take Route 80 West to exit 60 (Route 20 Hawthorne), merge onto Route 20 (Mclean Blvd). Follow Route 20 for approximately 3.2 miles. As road narrows and ends bear right over Maple Avenue Bridge. At the light, turn right after bridge make left onto Wagaraw Road. Follow Wagaraw Road through two traffic lights; make a right onto Lafayette Avenue. Pleasurable Piercings is #417 Lafayette, just under a mile on right side. From Pennsylvania / Western NJ – Take Route 80 East to exit 60 (Route 20 Hawthorne), bear left off exit; merge onto Route 20 (Mclean Blvd). Follow Route 20 for approximately 3.2 miles. As road narrows and ends, bear right over Maple Avenue Bridge. At the light, turn right after bridge make left onto Wagaraw Road. Follow Wagaraw Road through two traffic lights; make a right onto Lafayette Avenue. 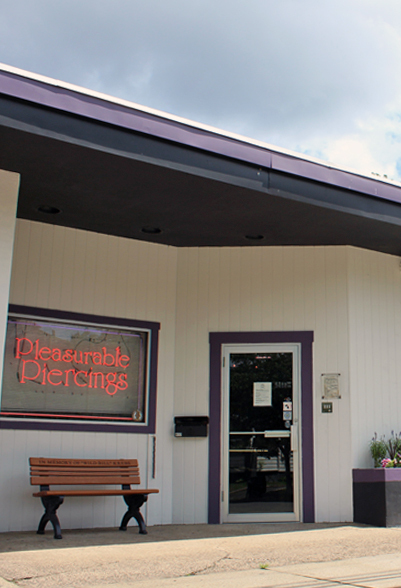 Pleasurable Piercings is #417 Lafayette, just under a mile on right side. From North Jersey / New York State – Take Route 17 South to Route 4 West. Merge onto Route 208 North. Follow Route 208 to the second Goffle Road Exit (Hawthorne/Paterson). Get off at the exit and make a left at the first light (Lafayette Avenue). Pleasurable is located at #417 Lafayette Avenue approximately 2 miles on the left. From South Jersey – Garden State Parkway North to Exit 160. Make a left at the light at the bottom of the exit. Follow that thru one light to Route 208 North, go over the underpass, bear right, under overpass and onto Route 208 North. Follow Route 208 to the second Goffle Road Exit (Hawthorne/Paterson). Get off at the exit and make a left at the first light (Lafayette Avenue). Pleasurable is located at #417 Lafayette Avenue approximately 2 miles on the left.